""We don't actually explain the details to Aiba-kun until the day of the shoot. If we tell him you must say this or you must do that, it ends up feeling too planned and we lose the freshness of that first reaction, I think"
That's so smart of him, I really love how fresh and natural Aiba behaves in this show. I think that's one of the main points I love about this show. He looks so happy doing it, I think he looks even more handsome than in any other show. Well, I enjoyed a lot this interview. 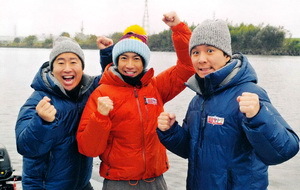 It states again how wonderful Aiba is as a person, from someone that knows him well. Thanks for sharing!! !